The App Store launched in July of 2008, ten years ago next week, and to celebrate Apple on Thursday marked how far the store has come in its first decade by offering a brief history painted by the words of developers who sell their wares on the marketplace. After the first iPhone launched in 2007 without any third-party apps, Apple announced that fall that it was opening up its platform to such apps. The App Store opened for business on July 10, 2008, the day before the iPhone 3G was released. The App Store launched with just 500 apps, a number that reached 2 million earlier this year, according to Statista. On Thursday, ahead of the anniversary, Apple commemorated the occasion, with a press release that doubled as something of an oral history of the original development of the App Store. It makes clear not only how fast the App Store has grown, but how central the App Store has been to so many of the content and e-commerce innovations of the past decade. The App Store has also led to an explosion in growth for the business of app development itself. "In its first decade, the App Store has surpassed all of our wildest expectations — from the innovative apps that developers have dreamed up, to the way customers have made apps part of their daily lives — and this is just the beginning," Apple's Phil Schiller said in the release. "We could not be more proud of what developers have created and what the next 10 years have in store." The release quotes both developers and representatives of major partners (Major League Baseball, HBO Nintendo, and many other gaming companies) about how important the App Store has been to their business. It also charts how changes made possibly by the App Store — in-app purchases, content streaming, geolocation, and numerous other advances — have changed what they do for the better. Apple goes on to tout the growing technologies made possible by ARKit and HealthKit. "While there have been many notable moments since apps first came to iPhone and later iPad, the milestones and testimonials below reflect some of the most significant over the past 10 years — defining how the App Store democratized software distribution and transformed how we live every day," Apple said in the release. 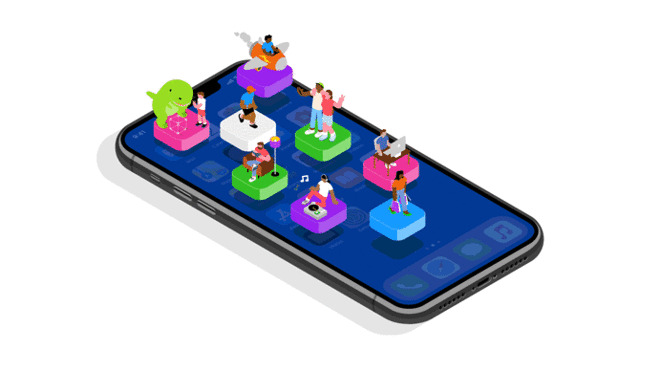 Apple offered a few statistics to go along with developer platitudes, noting more than 28,000 apps offer subscriptions to customers, a figure that accompanies a 95 percent year-over-year increase in total subscriber numbers. Further, some 500 doctors and researchers have used ResearchKit and CareKit to aggregate the health data of 3 million people across a number of multi-faceted studies. More than 500 million people visit the App Store every week, with more than 1 million people taking time to read articles and features posted to the new Today page that went live with an App Store redesign last year.